Risk adjustment in health insurance is at first glance, and second, among the driest and most arcane of subjects. And yet, like the fine print on a variable-rate mortgage, it can matter enormously. It may make the difference between a healthy market and a sick one. The market for individual health insurance has had major challenges both before and after the Affordable Care Act’s (ACA’s) risk adjustment program came along. Given recent changes from Washington, like the removal of the individual mandate, the market now needs all the help it can get. Unfortunately, risk adjustment under the ACA has been an example of a well-meaning regulation that has had destructive impacts directly contrary to its intent. It has caused insurer collapses and market exits that reduced competition. It has also led to upstarts, small plans and unprofitable ones paying billions of dollars to larger, more established and profitable insurers. Many of these transfers since the ACA rules took effect in 2014 have gone from locally-based non-profit health plans to multi-state for-profit organizations. The payments have hampered competition not just in the individual market, which has never worked very well in the U.S., but in the small group market, which arguably didn’t need “help” from risk adjustment in many states. The sense of urgency to fix these problems may be dissipating now that the initial rush for market share under the ACA is over and plans have enough actuarial data to predict costs better. There has been an overall shift to profitability. But it would be a serious mistake to think that just because fewer plans are under water, the current approach to risk adjustment isn’t distorting markets and harming competition. Amid fresh political rancor and legal machinations in the ongoing war over the Affordable Care Act (ACA), there’s a bright spot: Medicaid. At least for now. This matters. True to predictions made by Obama and supporters when the ACA became law (2010), it has taken years and a lot of blood, sweat and tears to get to this moment. As a reminder, the U.S. Supreme Court in 2012 ruled that states could opt out of the ACA’s Medicaid expansion—leaving each state’s decision to participate in the hands of governors and state lawmakers. On June 7, after a 4-year pitched political battle, Virginia became the 33rd state (plus DC) to expand Medicaid under the ACA. The Virginia expansion is projected to encompass 400,000 low-income Virginians. The state swung in favor of expansion after Democrats gained the governorship and more seats in the legislature in 2016. But, importantly, key moderate Republicans relented. In tribute to Uwe we are re-running this instant classic from THCB’s archives. Originally published on Jan 31, 2017. Everyone knows (or should know) that forcing a commercial health insurer to write for an individual a health insurance policy at a premium that falls short of the insurer’s best ex ante estimate of the cost of health care that individual will require is to force that insurer into what economists might call an unnatural act. Remarkably, countries that rely on competing private health insurers to operate their universal, national health insurance systems all do just that. They allow each insurer to set the premium for a government-mandated , comprehensive benefit package, but require that each insurer “community-rate” that premium by charging the company’s individual customers that same premium, regardless of their health status and even age (with the exception of children). American economists wonder why these countries do that, given that in the economist’s eyes community-rated health insurance premiums are “inefficient,” as economists define that term in their intra-professional dictionary. The Affordable Care Act of 2010 (ACA, otherwise known as “ObamaCare”) also mandates private insurers to quote community-rated premiums on the electronic market places created by the ACA, allowing adjustments only for age and whether or not an applicant smokes. But within age bands and smoker-status, insurers must charge the same premium to individual applicants regardless of their health status. As fellow economist Mark V. Pauly points out in an illuminating two-part interview with Saurabh Jha, M.D., published earlier on this blog, aside from the “inefficiency” of that policy, it has some untoward but eminently predictable consequences. It happens when healthier people disobey the mandate to purchase insurance, leaving the risk pools of those insured in the ACA market places with sicker and sicker individuals, thus driving up the community-rated premiums. As Pauly points out at length, a weakly enforced mandate on individuals to be insured can become the Achilles heel of community rating. 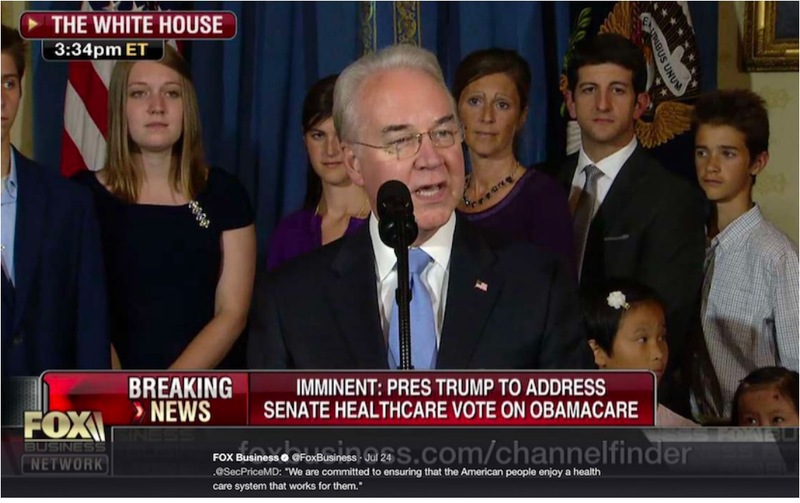 Tom Price, President Trump’s new Secretary of Health and Human Services (HHS) strode to the podium to the sound of applause. The two thousand medical administrators and physicians at the annual meeting of CAPG, a trade organization representing physician groups, heard him described as the most influential person affecting the 300+ participating groups that provide care for millions. Only the third physician to lead HHS, many hoped that the orthopedist and six term GOP congressman would bring new sophistication to the federal government’s healthcare programs.